Community Spotlight is a regular feature which highlights amazing fan projects in the Remedy community. For 2018 we're switching things up a little with each month having its own spotlighted fan and fan project. 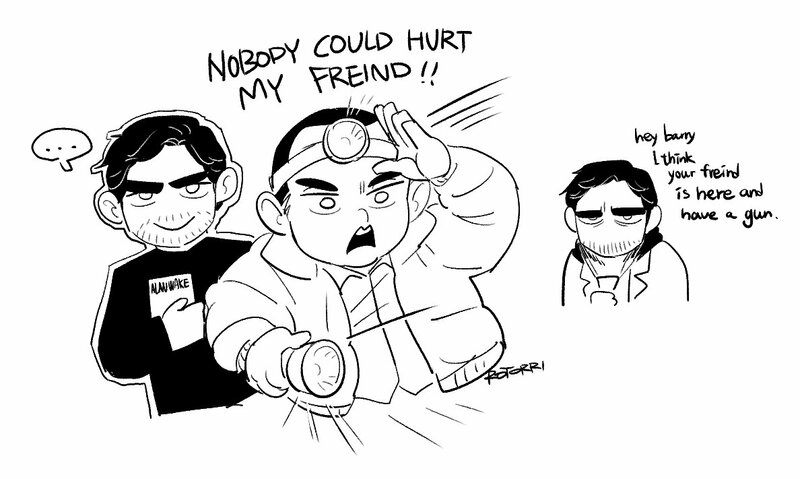 For our November feature I'm excited to talk to South Korea-based artist, Rotorri, whose gorgeous Alan Wake lineart has been making a delightful appearance on Tumblr and Twitter over the past few months. 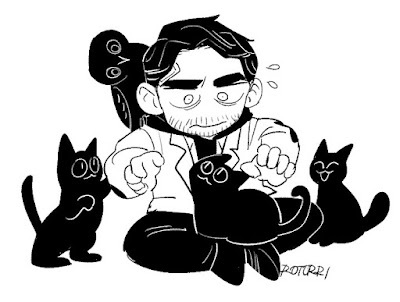 Alan Wake may have been released eight years ago but the adventure is still drawing in new fans, including the talented individual we're focusing on for this month's community spotlight! Rotorri is a wonderful artist based in South Korea who joined the fandom only this September and already has filled the community with stunning pieces. Rotorri makes beautiful black and white lineart pieces, carefully using colour; only including it for emphasis or to create a specific atmosphere/tone. The designs are professionally smooth and crisp, and the sketches can be described as both complex and minimalistic, with lines used beautifully sparingly with every one adding something to the piece whether it's movement or emotional depth. In all of his artwork emotion plays a big part, with a great amount of detail and attention put on facial expressions and body language to express exhaustion, dedication, or alarmed, whatever is needed for the piece. Even just glimpsing at the artwork, you get a sense of what it's conveying, with every aspect of it bringing the piece together. 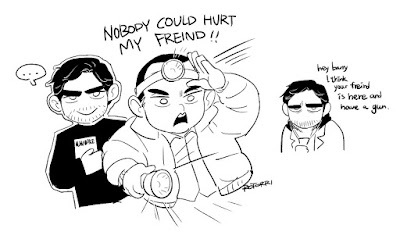 What makes Rotorri's work special is the way he blends his unique style with his wonderful sense of humour with Alan Wake injokes and references used to spice up the work. The references can be dark tones of the Bright Fall miniseries or light-hearted cat-filled art. The unique take, his perspective, and personal style has led to a utterly stunning series of Alan Wake artwork. I get [inspiration] from variety of places; I get inspired by music, circumstances, my life experiences, and my motivations. So I just keep and remember them when I express them into drawing. Your artwork has a unique and iconic style, how did you develop it? Were there any artists that inspired you? How and when were you introduced to Alan Wake? It was this September, I'd finished Fallout 4. 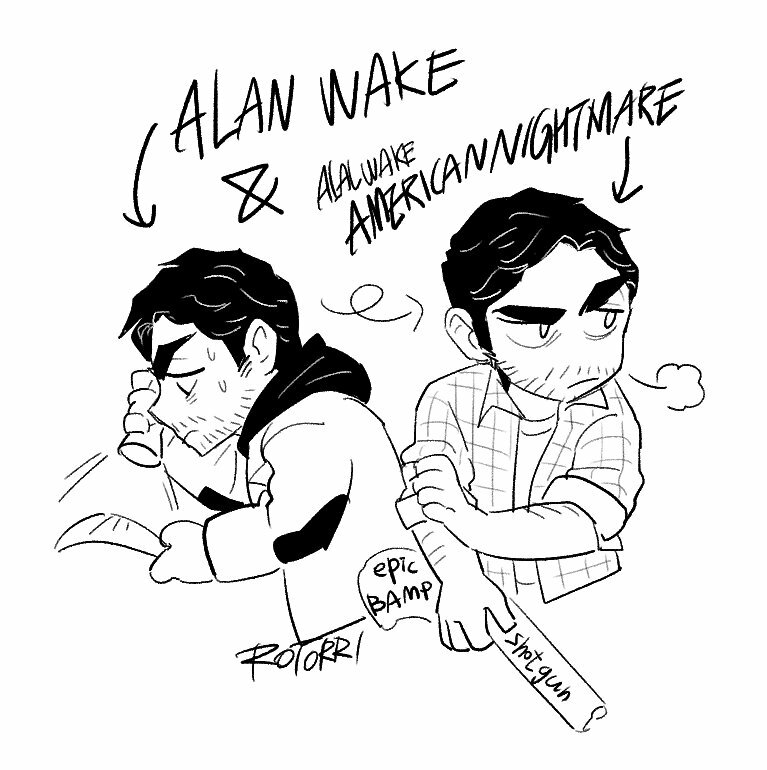 At that time, I realized that I'd stopped Alan Wake in Chapter 3, in 2014. Then I re-installed it, to complete the rest of the game and I enjoyed those moments. It was really interesting gameplay and [the game] reminded me of Cthluhu. At the end of episode, I felt some feeling as after watching the TV series or well-made movie. After finished the game, I figured out myself overwhelmed that I can't think other thing but Alan Wake. Yup. I dragged in myself. What made you decide to create artwork for the game? First thing was the story. I like the idea of whole story of AW. Second was the relationships and interaction between each characters. What would you like to see in a potential Alan Wake 2? Nightingale's story. I still wonder why he is chasing after Alan. Does he chase after Alan or Mr. Scratch? What happened in his town? I thought there might be a potential parallel universe, Alan has too. Also, I'm wondering what was '[it's not a lake, it's] an ocean's" meaning. :3 (plz do not say it is Ocean's 8). Thank you for taking the time to speak to us, Rotorri! 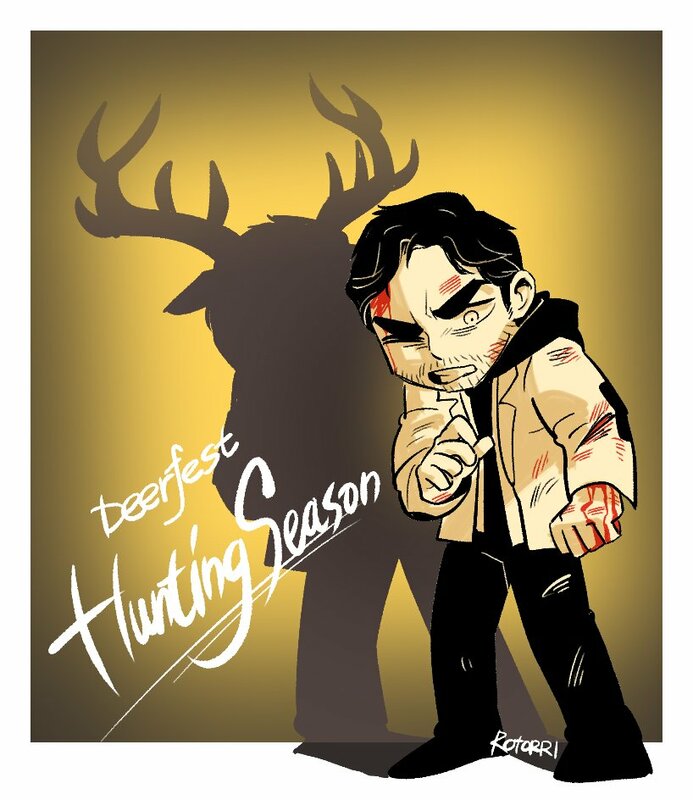 Make sure to follow him on Twitter and Tumblr for more wonderful artwork!